When Cassidy Walker stumbles into the middle of the highway, bloodied and bruised, Bard College in flames behind her, and manages to flag down a ride, she thinks the worst is over. Arriving in the nearby town of Red Hook, Cassidy tries to call her parents but the phone lines are down. Later she will discover that no radio or television signals are being received. The town, it seems, is cut off from the rest of the world – no one can get in and no one can get out. But that’s not the strangest thing by a long shot… There is more – but it ventures into Spoiler Country and I’ve views on ruining the reader’s experience by giving too much away in blurting blurbs. This story starts with a bang as Sullivan’s books generally do. And Cassidy is a wholly convincing, entertaining protagonist whose terrifying experiences are vividly portrayed. Although it gradually becomes clear that she isn’t exactly what she initially seems. Sullivan is a highly intelligent writer who isn’t afraid to push the envelope. As with all such artists, this means that the results can be variable. The overall story is full of tension and adventure and – mostly – moves along at a good clip. 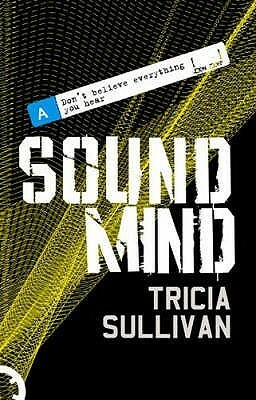 It was only about halfway through that I realised that Sound Mind is a sequel to Double Vision, which I’d read before I was organised enough to make a note of every book I read, on account of my chronically awful memory. Despite the fact that I couldn’t recall much about Double Vision, I didn’t have too much difficulty grasping what was going on in Sound Mind, so it certainly ticks the box of not relying on the first book in the duology to make it a viable read. One of Sullivan’s trademarks is to start with a credible problem set in a recognisable primary world setting, always portrayed with pin-sharp clarity. And as the story advances, she steadily pushes the borders of normality until we are confronted with something that is right on the edge of the fantastical – while still within the science fiction genre. Unlike a number of science fiction writers, Sullivan has no problem keeping her protagonists vulnerable and sympathetic as they are subjected to a series of increasingly bizarre ordeals. I really enjoyed the ending, which after the fantastic, multi-layered plot, could so easily have sold the reader short. It doesn’t. The role of music is thoroughly explored within this novel. Cassidy is a music student and comes to believe that it is one of her taped compositions that has brought into being the destruction that has sealed off Red Hook. She explains to the reader exactly what she was trying to achieve and why – and goes into a lot of fairly academic detail about her feelings about music as a personal anchor for her. As ever, Sullivan’s work is layered and clever, with constant touches of humour to help leaven the chaos and violence – and her discussions about music throughout the book are often enlightening and entertaining. However, there are also a few places where I think some judicious editing would have improved the pace of what is – essentially – an adventure story. I love the fact that science fiction is a genre where the story is often not only an entertaining escapist read, but a vehicle to explore ideas and themes, although this is something of a balancing act. At times, the discussions/explanations about the role of music silt up the pace and I found myself skimming across these sections, particularly in the second half of the book.